Olympic National Park is a fantastic place to bring children. Kids can explore nature, breathe in fresh air, do cannonballs into the pool at Sol Duc Hot Springs. I set out with my inner child into the park and offer these recommendations. Some of my favorite moments of my childhood were spent fishing with my father. 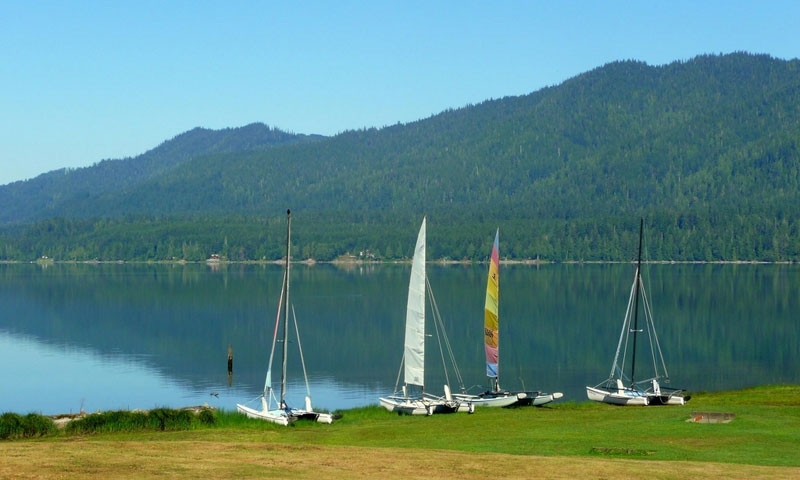 Why not make some memories with the next generation on the stunning turquoise shores of Lake Quinault. If a member of your party catches one of Lake Quinault's massive steelhead salmon, you have dinner! Catch or no catch, you've made memories. Is there anything cuter than a child trying to impress a National Park Ranger? I don't think so. Get some face time with the everyday heroes of Olympic National Park at the various ranger programs. Personally, my inner child would be a big fan of the songs and stories of the “Fireside Programs” that take place at Hoh, Mora, and Kalaloch Campgrounds. To find the ranger program best for your kid, check out The Olympic National Park Bugler, or the bulletin board at your campground. The Junior Ranger Program is always a great option for kids (and an easy way to keep them entertained). Sol Duc Hot Springs are geothermal, natural wonders ... but your kid won't care! They will be too busy in the swimming pool mastering the most epic cannonball that Olympic National Park has ever seen. With a pool side deli and kid friendly atmosphere, Sol Duc Hot Springs is a place where kids don't have to learn or explore. They just get to play and enjoy. Kalaloch Beach is a joy for kids to explore. At low tide, kids will enjoy the massive seastars and anemones living in the tide pools. The driftwood, local otters, seals, sea lions, and seashells are a blast for young scientists and future marine biologists to explore. There are miles of beach for kids to enjoy running, splashing, and playing.